The St. Regis Hotel Osaka is set in the heart of the beautiful Midosuji, a ginkgo tree-lined boulevard in Osaka. The design concept pays homage to the golden age of Japanese history, the Momoyama period – an era of hope, prosperity and harmony, and a time when Japan opened up trade between the east and west; a period which to this day has a deep emotional resonance for the Japanese people. 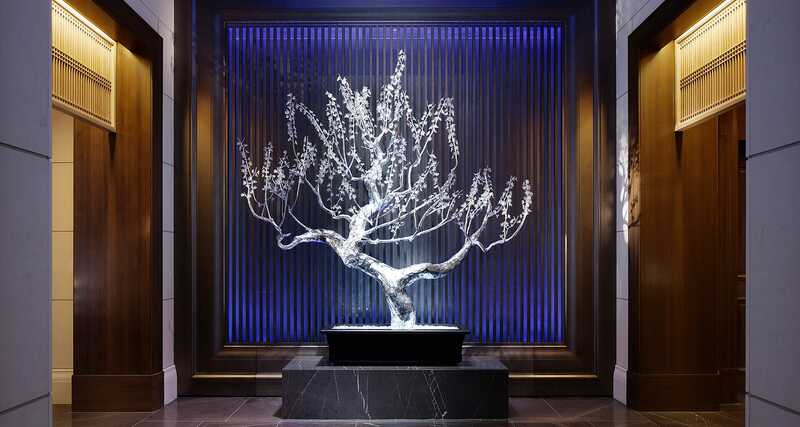 A guest’s journey through the St. Regis Hotel begins with the moonlight ambience of the entrance hall, a combination of silver leaf, bronze and dark marble flooring, with the sparkling crystal tree as the centre piece, leading through to the sun-drenched reception zone. 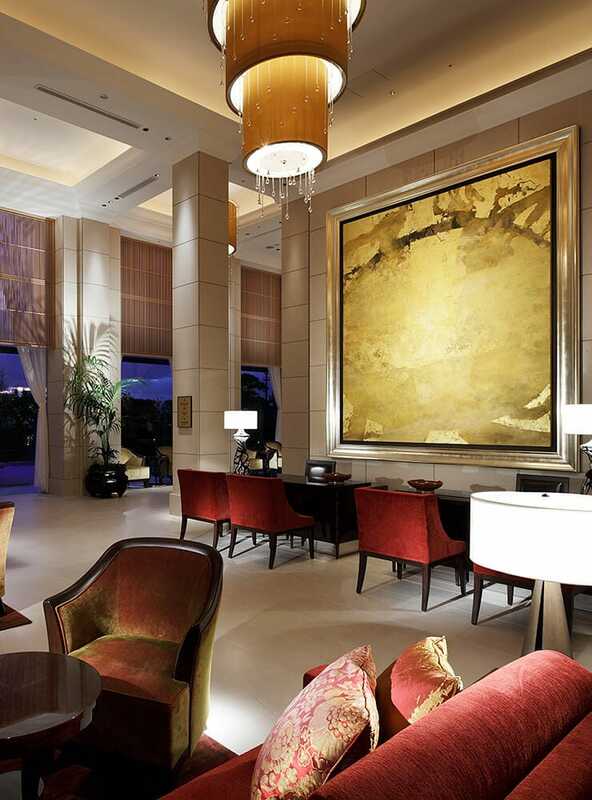 The Reception and Lobby Lounge evoke the brightness and power of the Sun. 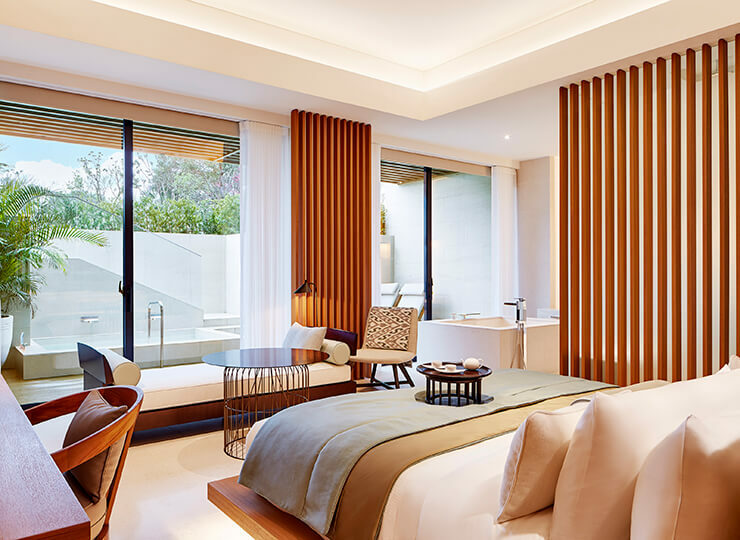 Large scale limestone tiles on the walls and floor reflect historic construction, high coffered ceilings and bespoke chandeliers create a gracious ambience enhanced further by the views over the private Japanese garden terrace and the city beyond. 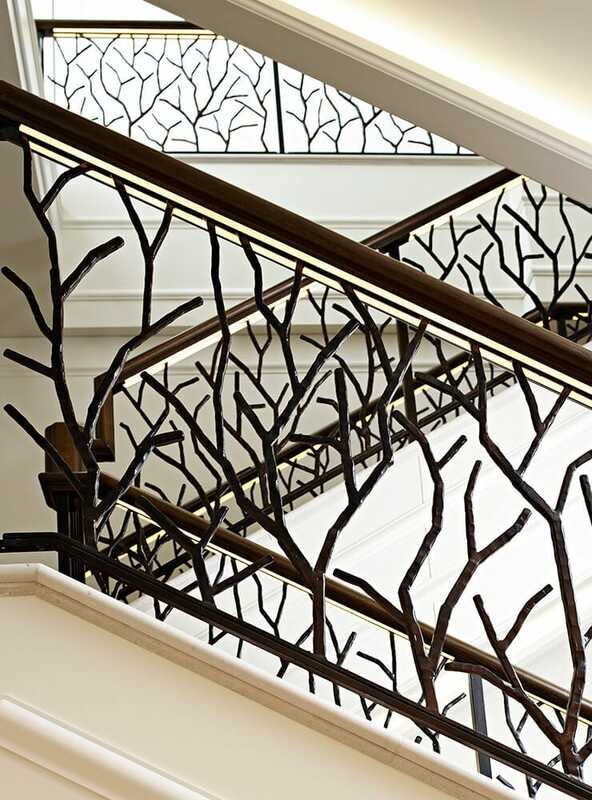 An intricate balustrade mimicking the branches of the Ginkgo trees during winter. Artwork played a major part in the design philosophy, beginning with the spectacular crystal tree at the ground floor entrance lobby. The unique collection of carefully selected artwork continues throughout the hotel including this original piece celebrating the sun. The hotel bar is approached through grand walnut doors. Deep turquoise panelled walls, a precious blue tiger’s eye bar counter, imposing full height mirrors and a deep corniced silver leaf ceiling reflect the Momoyama period. In the St. Regis tradition a specially commissioned mural painting provides the backdrop to the bar counter, where hidden details of Osaka castle, satellites and mystical animals will surprise guests as they sit at the bar. 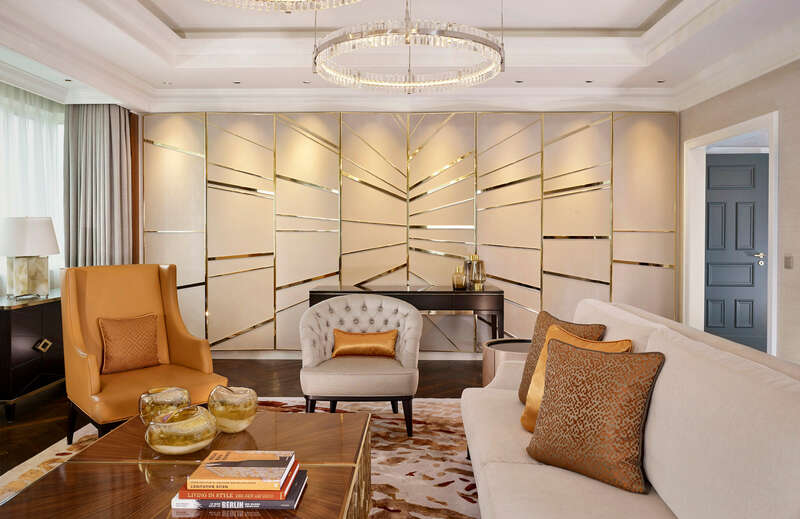 A lacquered grand piano and rich leather furniture add elegance and classical luxury, whilst Japanese influenced design details including tsuba inspired door handles, lacquered spirit display cabinets and a meandering floral rug in deep turquoise tones draw the guests into their locale. In each guestroom there is a fabric panel over the bed featuring either a soft cherry blossom design or a gingko leaf branch. The character of the main suites is born from a chosen Japanese plant that influences each individual colour scheme and suite name; Fuji (Wisteria), Hanashobu (Iris), Yuri (Lily). 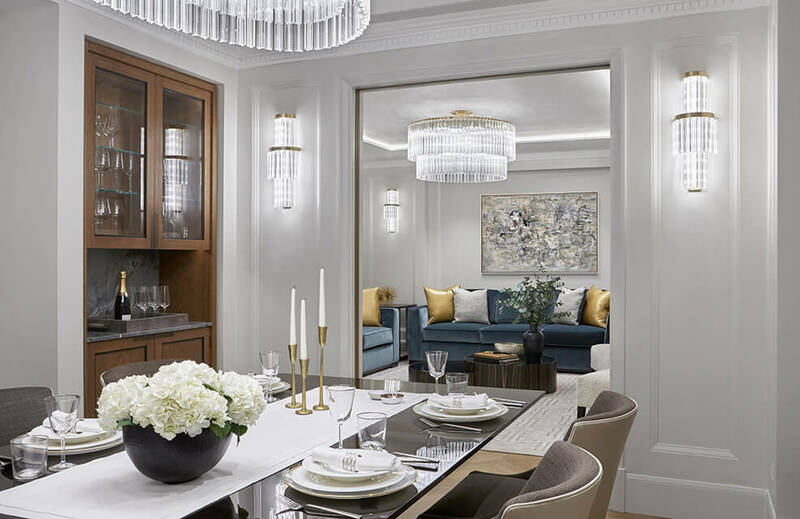 These exclusive rooms are further enhanced by marble fireplaces, painted timber panelled walls, and feature artwork display shelving in the living areas, paying homage to the heritage of the original St. Regis Hotel, New York. The Kiku (Chrysanthemum) Royal Suite with spectacular views of Osaka from all rooms and a gilded metal handmade screen to divide the main living area. The Royal Suite bathroom features an oval freestanding stone bath tub and double shower with large picture windows.